Geoff grew up in Woonsocket, Rhode Island. He graduated from the University of Rhode Island with his Doctorate of Physical Therapy in 2017 after earning his B.A. in Behavioral Neuroscience at Connecticut College. 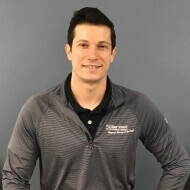 Geoff spent a year of his clinical affiliations working in outpatient orthopedic, inpatient acute, and outpatient aquatic programs in Rhode Island, Massachusetts, and North Carolina. While in school, he spent two weeks in Guatemala working at a clinic for children with disabilities. He enjoys working with patients of diverse backgrounds and has experience working with pediatric, geriatric, orthopedic and neurologic patient populations. Geoff was a track and field athlete in high school and college and enjoys running, hiking, and spending time with friends and family.